With an operating pressure of 2,700 the RB 400 is great for use around a larger property or small farm. 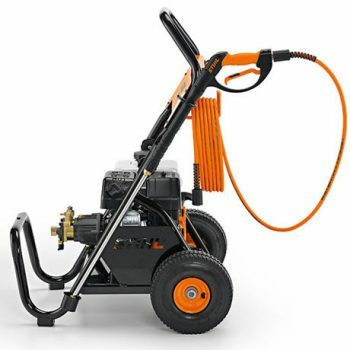 This unit comes with 1 1/4″ welded steel tube frame, 10″ pneumatic wheels and a brass manifold. Like the other RB units, this unit features a folding handle design for a space saving storage solution. Comes with a 25 ft. wire braided pressure hose.